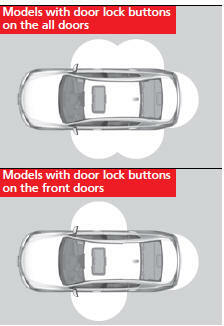 When you carry the keyless access remote, you can lock/unlock the doors and open the trunk. You can lock/unlock the doors within a radius of about 32 inches (80 cm) of the outside door handle. 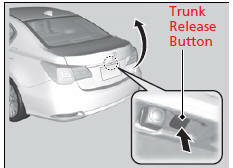 You can open the trunk within about 32 inches (80 cm) radius from the trunk release button. 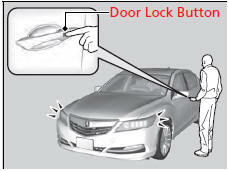 Press the door lock button on the front or rear* door. - Some exterior lights flash; the beeper sounds; all the doors lock; and the security system sets. • Do not leave the keyless access remote in the vehicle when you get out. Carry it with you. • A person who is not carrying the keyless access remote can lock/unlock the doors if a person who is carrying it is within range. • The door may be unlocked if the door handle is covered with water in heavy rain or in a car wash if the keyless access remote is within range. • If you grip a front or rear* door handle wearing gloves, the door sensor may be slow to respond or may not respond by unlocking the doors. • The door may not open if you pull it immediately after gripping the door handle. Grip the handle again and confirm that the door is unlocked before pulling the handle. You can customize the door lock mode and keyless lock acknowledgement setting. - The driver’s door unlocks. - Some exterior lights flash twice and the beeper sounds twice. - All the doors unlock. - The trunk unlocks and opens. • Even within the 32 inches (80 cm) radius, you may not be able to lock/unlock the doors with the keyless access remote if it is above or below the outside handle. • The keyless access remote may not operate if it is too close to the door and door glass. If you do not open a door within 30 seconds of unlocking the vehicle, the doors will automatically relock. When you go into the front side of the keyless access system working range with all the doors locked, the front and rear* door outer handle ambient lights come on for 30 seconds. The lights do not come on if you have previously stayed within the range for more than five minutes, or the doors have been locked for a few days. The feature activates again after you drive the vehicle, then lock the doors. The light flash, beep and unlock settings can be customized using the audio/information screen or multi-information display.